"What if I Couldn't be Bothered Tracking Macros?" That said, usually these people are either genetically gifted, or have developed a set of habits that allow them to get close to their optimal intake, whether they mean to or not! There are more than one ways to skin a cat. 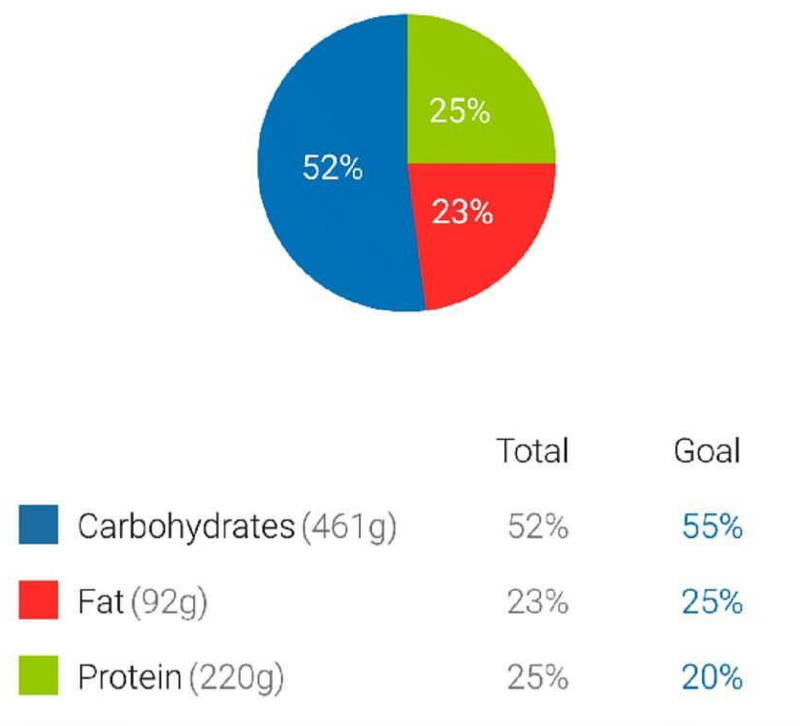 Tracking your macronutrient intake is one method of managing your intake, but if this isn’t sustainable for the individual, then other options are available, and should be used. Remember, following an 80% optimal plan consistently is better than having a 100% optimal plan and not sticking to it! The most important nutritional concept when it comes to body composition and performance is energy balance. In eating less energy (or in other words, fewer calories) than one is expending, a calorie deficit is created, which will lead to weight-loss and potentially a detriment to performance. Depending on the individual’s goals, these two things can be weighed up and balanced in order to allow for slow weight-loss and minimal loss of performance. The inverse is also the case, where a calorie surplus, whilst providing enough energy to fuel performance, will lead to weight gain, which may be good or bad, depending on the individual’s goals, and whether the weight gain is in the form of muscle or fat. In tracking our caloric intake, and making sure it is in the right place, we ensure that our performance is fuelled, whilst allowing us to make body composition changes, where needed. By tracking both calories and protein, you are providing the body with enough energy, as well as enough substrates for recovery. The potential downside is that you may not be optimising the energy sources since carbohydrate vs. fat intake is not being optimised. The only accurate way of doing this is to track all 3 macronutrients, so, as with all the alternatives in this article, some accuracy will be lost, and therefore progress may not be completely optimal. Again, its about being as optimal as you can, without making it so complex as to cause poor adherence. Since, as mentioned before, energy balance is correlated with changes in bodyweight, by simply tracking bodyweight, we are will be able to adjust our daily intake in accordance with bodyweight changes. In this case, since calories aren’t being tracked, the increase or decrease in intake will be done subjectively (eating ‘less’ as opposed to ‘100 kcal less’), in order to push our bodyweight in the direction we want to go, if body composition changes are a goal. On the other hand, for someone is optimising for performance, if bodyweight is decreasing, this may be a sign that they are not providing enough fuel for the training they are doing and therefore, they may need to increase their intake and focus on ‘eating more’. I suggest tracking protein along with bodyweight, since bodyweight is only indicative of weight lost and not necessarily whether that weight is coming from fat or muscle. By consuming enough protein, there will be a better chance of muscle being repaired and maintained, and therefore there is a better chance that any weight lost will be in the form of fat (provided that fat-loss is the goal obviously). This is especially important, since usually protein is the macronutrient that is under-consumed. This method could be used to simply create your own perfect day of eating, and stick to that as a meal plan. The danger here is the lack of flexibility. However, this can be removed by simply creating two perfect days of eating, where the meals are interchangeable. The obvious downside here is that there is a couple of hours of work required in the short term in order to come up with your ‘perfect day’. However, I do feel like this is very much worth it, whether you are planning on tracking your macronutrient intake, any of the above variations, or simply using it to create a meal plan for yourself. All of the above can be effective ways of controlling calories, either in cases of weight-loss, muscle gain and/or fuelling performance. Confusion often ensues when people confuse correlation with causation. For example, if someone sees weight-loss results by keeping their carbohydrate intake to night-time only, they may mistakenly say that eating carbohydrates during the day leads to weight-gain, when in fact, limiting their carbohydrates during the day may have just meant they stayed away from the donuts at lunchtime, and opted for salad instead of pasta at lunch-time. This change would have in turn created a caloric deficit, and therefore led to fat-loss. As mentioned in the previous article, for those whose goals necessitate them being as accurate as possible, tracking macronutrients is probably the way to go, but for those who don’t need to be that accurate, or are simply tired of tracking, but still want some accuracy, the methods outlined in this article present some decent options, of varying utility and accuracy.